Retail Solution Center is a privately held company and a WBENC (Women’s Business Enterprise National Counsel) certified women’s business enterprise. WBENC is the country’s largest certifying agency of woman owned businesses. RSC is proud to be the innovators of Soft Displays, durable temporary displays that use alternative and cost effective materials and processes. Our patent-pending combination of mix media displays uses wrapped paperboards in different texturized materials combined with plastics, acrylic and metals. The result is a prestigious fixture that costs half the price! AcriShield is our latest and most exciting innovation to date! Our patent-pending treatment of acrylic, produced displays that resists the cracking and crazing effects of alcohol contained in standard cleaning products and the overspray of perfume at cosmetics counters. 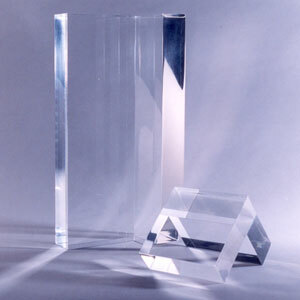 This acrylic can be fabricated or molded like any other acrylic. AcriShield increases a display's durability, life and beauty to save our clients money from prematurely replacing displays. RSC is proud to be the innovators of SeamLite a perfected bonding technique for acrylic. SeamLite virtually eliminates all glue and hardware lines to produce pieces that appear as a cast acrylic.